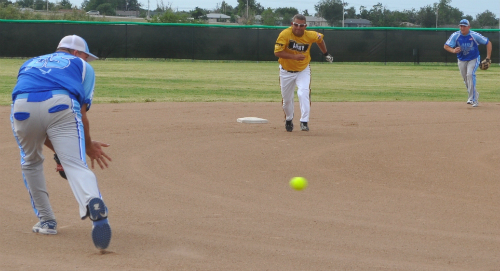 Army captured the men’s and women’s titles for a second consecutive year in the Armed Forces Softball Tournament held last week at Fort Sill, Okla. Air Force finished runner-up in both brackets. The Army women beat Air Force in the championship game Sept. 18, 6-3. Army finished the tournament unbeaten and went 8-0 in round-robin play. The Army men won their gold medal Sept. 19, beating Air Force, 23-8. In this game, Army never trailed, taking control of the game with a 10-run fourth inning. Army scored 217 runs in nine games, an average of 24.1 runs per game. The annual softball tournament features the top players from the Air Force, Army, Navy and Marine Corps in a five-day round-robin playoff.